At the beginning of the 20th century a new and original genre became widespread in the United States: “Self-Help” books. These books offered readers a colorful array of useful advice, and outlined paths to scoring achievements in a particular field that was generally mentioned in the title. 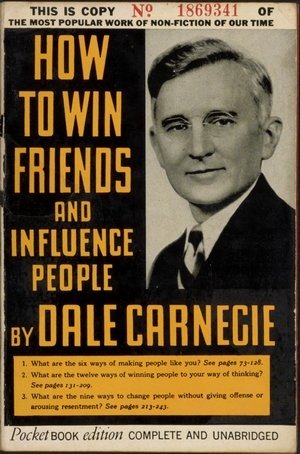 The most famous of these books was Dale Carnegie’s “How to Win Friends and Influence People,” which has sold more than 15 million copies to date and gave rise to many successful imitations. Quite a few of these titles, which star on bestseller lists to this day, deal with financial advice, but there is no need to turn to these to understand that the capitalist, utilitarian logic is the spirit blowing through the genre as a whole. Life is presented in Self-Help books as a development project, with the reader as its facilitator and operational contractor. He must attack his life vigorously, mine its resources and get as much net profit out of it as possible. If need be, he can and should lay off useless departments such as moderation, sensitivity and common sense. “Democracy introduces an industrial spirit into literature,” Alexis de Tocqueville observed back in the mid-19th century, and de Tocqueville is right, as usual. Most Self-Help books relied on the assumption (whose roots are to be found in the Romantic movement) that man possesses inner resources he must discover and exteriorize. Therefore the advice they offered usually revolved around the ways and methods to dredge up those hidden treasures. A human being is called upon to find within himself courage, determination or creativity, which he or she had no idea existed, but which the book explained that even if these had gone undetected until now, the hidden stores are nothing less than their deepest, innermost self. The notion that redemption begins from within built its home on the basis of the modern individualism and ideal of independence and economic initiative characteristic of American culture. Together with the spirit of invention and technological innovation, Self-Help books gave their readers a feeling that not only in the economic sphere, but in each and every area of life is to be found “a method” that will make it possible to manipulate the data, and ultimately maximize profits. 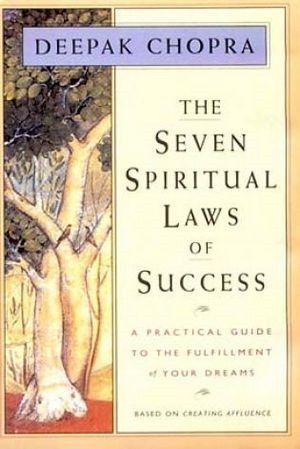 Inevitably, self-help books began to be written in the religious-spiritual realm as well. This domain is not limited to systematic instructions for the most effective ways to communicate with the upper worlds, but often involved advice that is based on religious and traditional sources, but is actually meant to assist us in secular areas. As an example of this we can cite more than 50(!) different titles in English alone that proclaim they teach “the Tao of” (parenting, gardening, sexuality, cooking, business). These books profess to glean insights from the ancient Chinese tradition to improve the quality of our Western lives in the present. Everything, as you know, makes its way to us belatedly, but the good news is that not only hath Israel not been forsaken by his God, but he has been bequeathed a fortune. In recent years it appears that Israeli Judaism has finally joined the trend, and self-help books based on the wisdom of Jewish tradition crowd bookstore shelves. Yedioth Ahronoth Books is the clear leader in this market segment, a fact that corresponds to its overall, and praise-worthy, efforts to enrich the Jewish bookcase with many and diverse offerings. 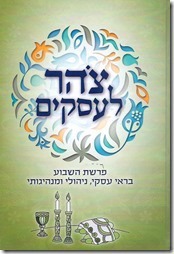 Two years ago this publisher came out with a book (in Hebrew) bearing a subtitle that leaves no room for doubt as to the book’s role in the genre in question: “Once a Week: Insights and Self-Empowerment from the Portion of the Week,” by Aharoni Berenstein. The ways to draw insights and self-empowerment from the weekly Torah portion have only grown more numerous since then. 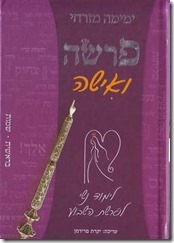 The new book by Rebbetzin Yemima Mizrachi, :“Parasha ve’isha: Limud Nashi Leparashat Ha’shavua” (“Portion and Woman: Feminine Study of the Portion of the Week”) is a fine example of this. Mizrachi is one of the most prominent of the popular spiritual women leaders in the field of Judaism in Israel. She is a lawyer and rabbinical pleader by training, and today she gives lessons on Jewish tradition and the weekly Torah portion all over the country. Thousands of women subscribe to her mailing list, and the gatherings she holds always draw a big crowd. As may be learned from her new book, the weekly portions serve her as a pliant and productive base on which to offer advice and insights that contribute to the empowerment of her disciples. What does this feminine study look like in practice? According to Mizrachi’s book it entails using the Biblical narratives to understand how one ought to await a match, manage relationships and raise children. The portion “Hayei Sarah,” for example, deals with problems of couples’ relationships, “Toldot” – with parenting, “Miketz” teaches us that being chubby is perfectly fine, and “Vayigash” elucidates the importance of crying. In general, feelings and managing them are the main topic one can learn from the weekly portions, and eliciting them from the Biblical text known for its stinginess when it comes to sentimental expression is no mean feat. 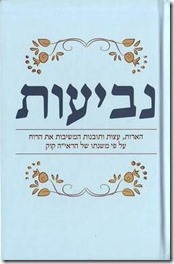 The title of the book “Neviot: He’arot, Etzot vetovanot Hameshivot et Harua’h Al Pi Mishnato shel Harav Avraham Yitzhak Hacohen Kook,” makes it clear that here too is a self-help book that culls its life wisdom from the field of religion. This time not the weekly Torah portion but Rav Kook has been chosen to restore our spirit. Freund’s explications look out upon the rabbi’s words on the facing page, whereas the words of Rav Kook are arranged in short lines and centered, like poetry. Here too the guiding principle is mining the treasures hidden in the depths of the soul: “In man (…) there are great and enormous spiritual powers of an entirely different order, which he must appreciate and respect,” Freund writes. Rav Kook is a giant thinker and outstanding poet, and his words presented in this book are inspiring. Praise is due to the compiler, Yuval Freund, who was not afraid to bring also excerpts that might jeopardize the readers’ automatic allegiance to the Halakha, or Jewish law. Rav Kook calls, among other things, for deviating from the familiar structures and listening to our inner voice. The tension between the inner voice and obedience to the heteronomic Halakha should be obvious, and for anyone interested in unquestioning loyalty to tradition a certain risk is inherent in bringing such things from the mouth of such an authority. Advice on coping with this inner conflict, incidentally, is not included in the book. We return to the weekly Torah portion with another title that represents a similar spirit: “Tzohar Le’asakim: Parashat Hashavua b’re’I Iski, Nihuli umanhiguti.” This book is a collection of short articles by some of the rabbis from the Tzohar organization, including its stars: Rabbis Yuval Cherlow, David Stav and Shai Piron (currently the Israeli Minister of Education). It should be mentioned that women are not absent from this volume and have penned several of the articles in it. As the book’s title suggests, in this case the weekly Torah portion serves as a source of insights into the business world. The book is essentially an anthology of articles that were sent over the past decade to a list of Israeli businesspeople. The mailing list in question is the brainchild of Eran Rolls, a businessman who describes himself as someone with “a transparent skullcap” or “a religiously observant secular person,” and is himself one of the varied fruits of the Jewish renaissance in the country. Rolls initiated a weekly mailing of the portion of the week to his distribution list, which kept growing as the years went by. The advice is nothing you could not guess in advance. Initiative, persistence, creativity, determination, taking advantage of opportunities, and originality – the weekly Torah portion teaches us all of these to assist our success in business. To the Tzohar rabbis’ credit, they seek to advance not only the personal success of their readers, but also the employment conditions of those employed by them. Many articles emphasize the moral dimension of the business world, and demand that the reader turn his attention also to the ethical implications of his actions. 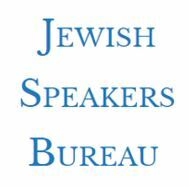 The examples cited above indicate a gradually expanding trend of Jewish Self-Help books, or in other words: the assimilation of Jewish tradition into the main trends in the global book market. Moreover, the books mentioned here are not only representatives of Self-Help books, but also expressions of a broad cultural movement that presents increased preoccupation with our emotional life, and an emphasis on a utilitarian worldview. It is a crossbreeding of the romantic inclination to find uniqueness, authenticity and meaning within us with the instrumental logic of the capitalist market. This match leads to a rich supply of “methods” and “systems” with whose help we will put into practice the hidden lights in our inner selves. That isn’t necessarily bad, of course, and perhaps there really are within us hidden dimensions and unseen potential powers. But we should pay attention to this process, in which both tradition and the Jewish bookcase become raw material in the hands of the market, and translate themselves into the patterns of that same familiar utilitarian logic. Interestingly, fundamentalist religion, in Afghanistan or Mea She’arim, is one of the few foci today of stubborn resistance to capitalist globalization. It resists a lot of other things too, but it is possible that precisely by posing a determined alternative, which expresses a different worldview and a different logic, it invites us to learn something very important about ourselves; something no less important than how to wait patiently for a decent match or how to close the next deal. Published in the literary supplement of Haaretz.